AIST is committed to providing the highest quality technical information through our electronic and print publications. AIST’s online Bookstore includes hundreds of iron- and steel-related books, maps, and individual technical articles from a variety of publishers. The premier monthly magazine for steel industry professionals. 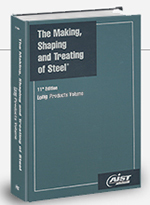 AIST’s Bookstore offers a wide variety of technical books and steel industry publications. Discounted prices are available for AIST Members! The Directory—Iron and Steel Plants is the essential industry reference guide. Long Products provides a comprehensive overview of long product production from describing the roll pass design, to the different shapes and sections, to the manufacturing of wire and wire products, to tubular products and finally to high-alloy steel semi-finished products by casting and ingots.